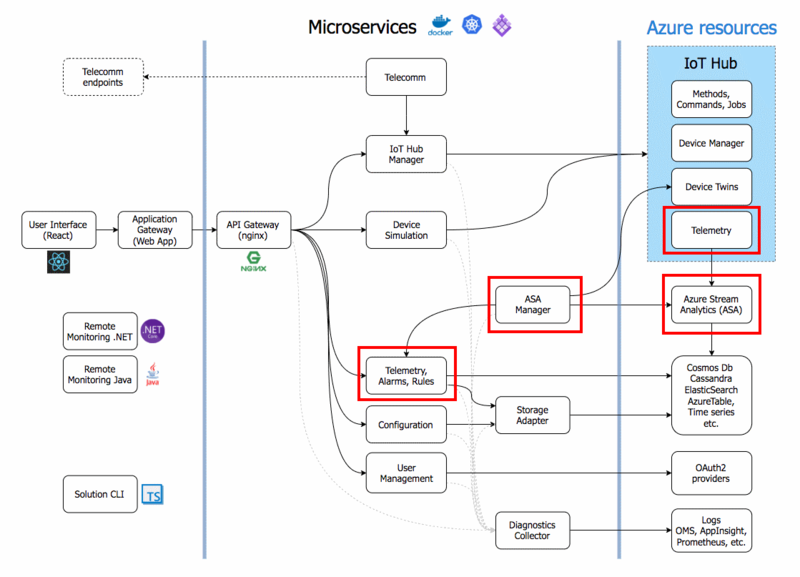 The family of Azure IoT resources is very diverse. If you know what you are doing and have developers available you can have a great time with the many PaaS cloud resources. If you have devices which need internet connectivity but you have no developers, you can check out IoT Central, the SaaS IoT solution. Recently, Microsoft announced a very powerful integration with other leading IoT Platforms like SAP Leonardo and PTC Thingworx. Both can connect directly with the Azure IoT Hub, the cloud gateway. This opens a broad range of integration opportunities. And last but not least, you can start with prebuild verticals, Azure IoT accelerators, formerly known as Azure IoT suites. If you have developers available but you do not want to start from scratch, check them out. You can deploy a typical accelerator in 15 minutes to see how they behave. And the smart thing is, all the code behind the logic is available for free on Github. But there are also third-party accelerators. If you are a developer or architect, it’s time well spend checking them out! In one of our current projects, we were looking for a rule engine. And while playing with the demo of the Remote Monitoring Accelerator, we stumbled on one. The picture shown above is not really helping to explain how this rule engine works and you can try to read about it or check out the code on GitHub. And the best feature is that the rules engine is based on Azure Stream Analytics. Therefore it’s modular and it can be separated and reused completely in your own solution. In this blog, we will see how it’s done. Recently, Microsoft put some real effort into updating the OPCPublisher project. This application/IoT Edge Module ingests telemetry from an OPC-UA Server. I already wrote two blogs about it: Getting started with OPC-UA on Azure IoT Edge and Managing nodes from the cloud in the OPC-UA Publisher Edge. The seconds one showed how to connect to the OPCPublisher as an IoT Edge module using DirectMethods. New methods have arrived, this time we get information about the module itself. Last week I was testing the temporary storage in IoT Edge. I was interested in the stability so I wanted to know if messages were missing or maybe even coming in twice. I have this heartbeat module which produces a counter. So I am able to generate messages which can be measured as a sequence. But this can be seen as a more generic issue, comparing two messages after each other. So I was thinking about Azure Stream Analytics. This should be the perfect tool for this job. Let’s check out how we can compare subsequent messages using Stream Analytics. Recently we were testing Azure IoT Edge on VMs which were limited in size. All went well, everything worked as expected until the whole solution stopped working. After some research, we found out the VM disk was full of data. This came to us as a surprise. What was eating up the hard disk? Here you find folders, one for each container on your system. These are named after a unique GUID which is related to a specific container. Note: you might need elevated rights to actually access these folders. If you open one of these folders you will find the logging of the related container. We can, of course, remove the old logging by removing the files and everything seems to be working again. But that only delays the inevitable. Let’s see if there is a more permanent solution. Azure IoT Edge makes it possible to send messages to your IoT Hub using the extremely flexible IoT Edge runtime and modules. The runtime also supports temporary offline capabilities in case the IoT Hub is unreachable. Currently, runtime 1.0.5 is available which makes it possible to set a custom location (folder) in which messages are stored before they are sent to the IoTHub. If you look at the routes page in Azure IoT Edge configuration wizard, what do you prefer? 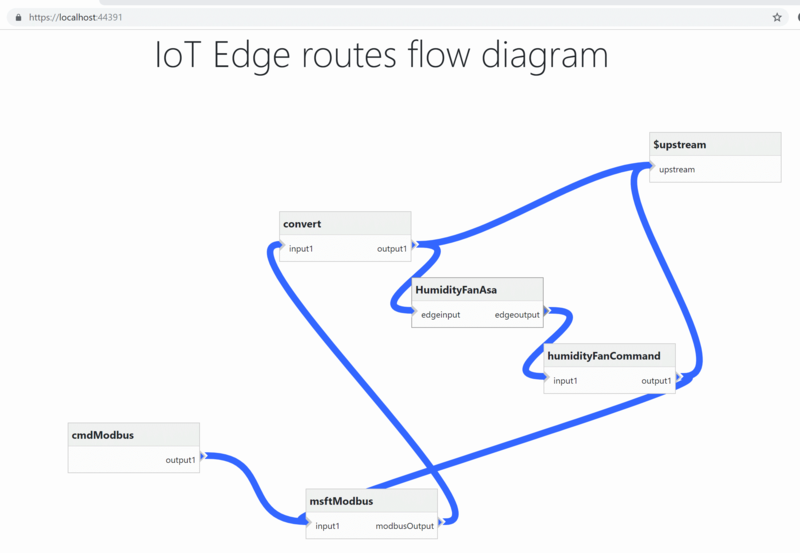 The routes in Azure IoT edge are a clever solution to describe how messages from one module are sent to another. But the JSON notation can become less readable once you add more (up to twenty) modules. That could end up eg. nineteen routes or more! Just as an experiment I was thinking about how the ease the experience using a graphical interface. I prefer the second solution, probably just like you. So let’s look at how you can create the same experience with your routes of your IoT Edge device. 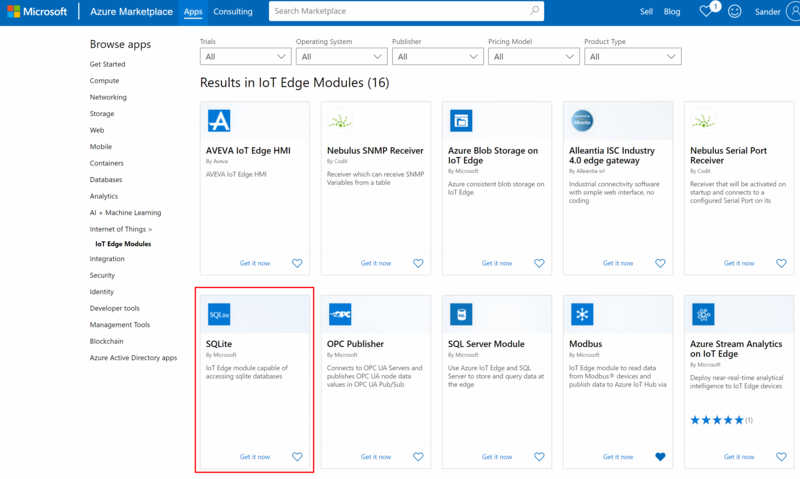 Microsoft has opened the Azure Marketplace for IoT Edge modules. This makes it easy to find and install IoT Edge modules into your own IoT Edge devices. We see a few well-known modules from Microsoft which support SQL Server, Modbus, OPC-UA or the Temperature sensor simulation. One of these modules is supporting SQLite. According to the homepage, SQLite is an in-process library that implements a self-contained, serverless, zero-configuration, transactional SQL database engine. The code for SQLite is in the public domain and is thus free for use for any purpose, commercial or private. SQLite is the most widely deployed database in the world with more applications than we can count, including several high-profile projects. This IoT Edge module is capable of accessing SQLite databases locally. The module is open source and both documentation and source code are put on GitHub. Why should we use this module? In the past, I checked out the SQL Server IoT module to persist IoT messages locally. For me, that last item, we can integrate the module directly in the routing is interested. So let’s check out how we can use it.